There are a few very common types of pain that come along with working at the office. They may seem unnoticeable at first, but they can build-up over time and turn into at best tolerable annoyances and at worst things that actually have a negative effect on your health. The good news is that as with any problem, there is a solution. The most common discomfort associated with working at the office would be the back pain that comes from sitting at your desk. This is not at all surprising seeing as how office work is primarily characterised by spending entire working days in a chair, bent over a keyboard or some documents. 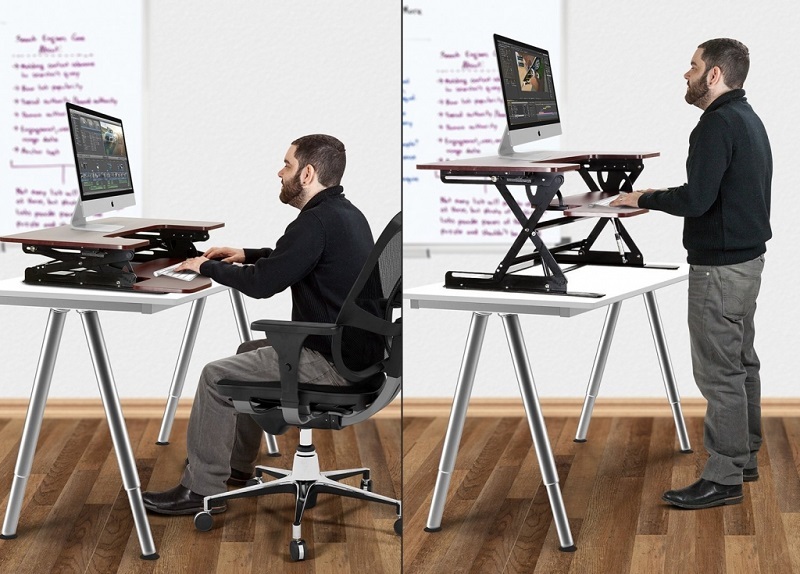 The best possible remedy then, would be a device like the height adjustable desk. The way that the height adjustable desk can help anyone faced with recurring back pain is by allowing the user to change from a sitting to a standing position while working, thus not letting his joints grow stiff. Now, even though there are many descenting opinions about whether you should spend the majority of your time at work sitting down or standing upright, the truth is that there are as many positive side-effects as there are negative when it comes to doing either for extended periods of time. Sitting at your desk for a very long time has been known to result in people developing problems with their posture from the position they are forced to adapt while staring at their monitors, as well as leg pain that comes from sitting in a chair for eight hours a day. Standing desks are also associated with back pain, though closer to the shoulders, because of the way work is done on such a desk makes the shoulder placement awkward and uncomfortable. And, while it doesn’t cause so much leg pain, standing all day takes a significant toll on the feet. There are of course benefits to each type of desk as well. The standing desk gives more energy because of the better blood circulation, and the sitting desk can be much more suitable for certain tasks that require precision. There are other perks as well, but while each type of desk has their own characteristics that are exclusive to them, a height adjustable desk can give you all of the benefits of both, while negating all of the negative side effects. If you feel like you are getting tired from standing or stiff from sitting, all you have to do is change the height and you can easily get rid of any discomfort easily. Aside from a built in massage feature, what more could you ask for?